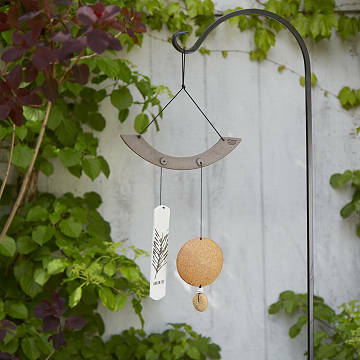 The high-fired clay components of this wind chime make a Zen-worthy sound. "Pare down to the essence, but don't remove the poetry." This reflection by author Leonard Koren encapsulates wabi-sabi, the Japanese aesthetic concept of the beautifully imperfect, impermanent, and incomplete. Through its asymmetrical array of earthenware forms, Tim Hull's wind chime is a kinetic reflection of wabi-sabi style. The contrasting shapes are made from black stoneware, red stoneware, and white porcelain, all high fired to produce a uniquely tinkling sound when stirred by the breeze. The white porcelain piece features feather and floral motifs with the word serenity as a reminder to seek restorative beauty in our everyday surroundings. With a mildew and UV-resistant polyester hanging cord, the chime is designed for either indoor or outdoor use. Handmade in Arizona, home of the Sedona Zen Center. Tim Hull believes that a simple, uncluttered design can bring calm and relaxation to anyone’s environment. The raw, natural beauty of the American Southwest landscape around his Arizona studio is a major influence on the colors, forms, and textures used in his work. Whether he's producing tried and true forms in his studio or creating new designs, peace and harmony are always at the core of this self-taught ceramic artist's creations. Beautiful addition to our garden! It has a very unique look and complements our garden area that already had an Asian feel. I wish I bought this item for myself! The colors are very attractive and the message, "serenity," is probably very appropriate for most people.